Rural Culture in general, and Pyrenean culture in particular, has started a journey without no return to progress and modernization. Montserrat Guiu, Albert Galindo and Cinta Pujal, all of them residents in La Seu d’Urgell, thought it was possible, and maybe required, to start an audiovisual proposal with the intention of preserving, promoting and spreading the culture of our closest environment: The Pyrenean Culture. The challenge is to increase awareness towards the mountain and its surroundings. Knowing it is not an easy task and impossible to do without any means, these three people decided to set up an association to direct and manage their proposals. 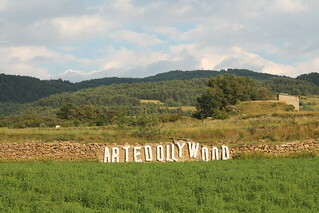 PICURT started in 2006 in Artedó, a small village of the Pyrenees as a mountain short film festival. With this event, in addition to the film screenings, also took place cultural expressions such as literature, music, art and gastronomy characteristics of the Pyrenees. The organizers consider this project as a reinforcement to the Pyrenean identity and to the creation of an image of territorial development of the people living in the mountains. In 2009, PICURT expanded to a 5 days and 2 locations schedule, Artedó and La Seu d’Urgell, showing films for three days at the local cinemas in La Seu d’Urgell prior to the old two day festival in Artedó, projecting in the school and in a big tent specifically placed for the event. The organization thought that it was important involving La Seu d’Urgell due to its appropriate infrastructure for all the other activities like workshops, lectures, gastronomic tasting and leisure. This expansion has allowed to increase the number of films that the organization thought were a “must see”. Mainly European and winners of European mountain film festivals that, otherwise, wouldn’t be shown due to its non commercial charachteristics. PICURT is now a competitive festival, and it has helped our society to raise awareness about the reality of living in the mountains. It has become a very important cultural movement to value what mountain culture offers. With ten years of existence of the CEP association, and given the success of previous editions, the organizers are motivated to continue working towards the eleventh edition, which will be held the second-to-last week of June 2017.